The first Hum awards were made all the more conspicuous by the attendance of a very large number of celebrities at the Expo Centre on Tuesday night. The red carpet came alive with interviews of superstars, fashionistas and solo/group music acts who came forth in large numbers to support the awards ceremony organised by the popular entertainment channel. It was followed by the awards ceremony which started somewhat late and continued well past midnight. 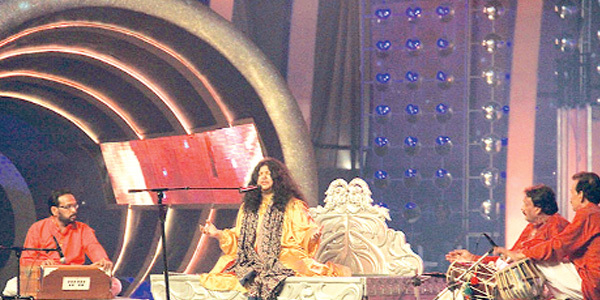 Renowned folk and Sufi singer Abida Parveen opened the event by singing ever-popular numbers, Yaar Ko Hum Ne Jabaja Dekha and Naara-i-Mastana in her typical style, followed by a word from the main sponsor. Hosts Mahira Khan and actor-model Mikael pulled a few light-hearted punches at interior minister Rehman Malik shortly before the award categories were announced. A heartfelt moment arrived when Anwar Maqsood was called onstage to give away the Lifetime Achievement Award to Moin Akhtar, and the trophy was received by Bushra Ansari in the absence of the late performer’s son. A premier song and dance performance from Pakistan’s first sports film presented by Humayun Saeed’s Six Sigma, Main Hoon Shahid Afridi, was up next followed by more awards in the fashion category. Bushra Ansari announce Recognition Awards to be given away to 10 legendary Pakistan TV artists by Hum Network CEO Duraid Qureshi. They recipients were: Nayyar Kamal, Zaheen Tahira, Badar Khalil, Qazi Wajid, Mohammad Qavi Khan, Talat Hussain, Munawwar Saeed, Anwar Maqsood, Shakeel and Abid Ali. Co-host Wasay Chaudhry then joined Mahira Khan to carry on with the ceremony punctuated by a song and dance medley featuring Ahsan Khan and Mehwish Hayat on Bollywood hit numbers Mujhe To Teri Lut Lag Gaye from Race 2, Matru Ki Bijli Ka Mandola from the film by the same name and Biddu’s remix of Nazia and Zoheb Hasan’s Disco Deewanay. Umer Sharif was rightly introduced on stage as the ‘King of comedy’ and he lived up to the reputation first by tricking both the technical crew and audience into believing the sound system had given way, and then picking on old-time friend Jawaid Sheikh in an exchange of banter. He then went on to deliver his version of improvisational stand-up comedy by passing comments on the flooding of Chinese products in the local markets as well as a hilarious recollection of the different accents adopted by in flight cabin crew while making announcements on the PA system and otherwise. Punjabi Indian artist Rabbi Shergill was the big surprise of the evening and straightaway he launched into a live version of Challa followed by more lively renditions of Bulla Ki Jana Mein Kaun, Tere Bin Sanu Sohniya and Challa again. Hum TV Network president Sultana Siddiqui then called on the blockbuster serial Humsafar team to present them with awards in various categories ranging from production, technical crew and cast. The following are the categories and winners who received trophies at the event: Best Solo Artist: Shehzad Roy (Apne Ullo); Best Music Video: Sayed Ali Raza (Bailiya by Faakhir); Best Original Soundtrack: Mere Qatil Mere Dildar; Lifetime Achievement Award: Moin Akhtar; Best Designer — Women’s Wear: Nomi Ansari; Best Designer — Menswear: Deepak Perwani; Best Model — Female: Ayyan; Best Model — Male: Abbas Jaffri; Best Actor in a Comic Role: Uroosa Siddiqui; Best Sitcom: Extras; Best Host: Fahad Mustafa; Best Drama Series: Kitni Girhain Baqi Hain; Best Actor Female Soap: Sumbul (Raju Rocket); Best Actor Male Soap: Imran Aslam (Nikhar Gaye Gulab Saaray); Best Soap: Mujhe Roothnay Na Dena; Best New Sensation — Television: Shehryar Munawar (Mere Dard Ko Zaban Milay) & Soonha Abro (Sanjha); Best Actor in a Supporting Role — Female: Samina Peerzada (Roshan Sitara) & Shagufta Ijaz (Mere Qatil Mere Dildar); Best Actor in a Supporting Role — Male: Mohib Mirza (Shehr-i-Zaat); Best Writer — Drama Serial: Umera Ahmed (Maat); Best Director — Drama Serial: Farooq Rind (Sanjha); Best Drama Serial: Shehr-i-Zaat; Most Challenging Subject: Dastaan; Excellence in the Field of Music: Raees Ahmed Khan; Best On-Screen Couple: Fawad Khan & Mahira Khan (Humsafar); Best Actor — Female: Mahira Khan (Shehr-i-Zaat), and Best Actor — Male: Noman Ijaz (Bari Apa).